VIMKO is introducing junior Portable Induction Cap Sealing Machines, the fastest and most effective way of sealing containers with foil membranes, with an inner foil seal providing a true hermetic oxygen barrier that prolongs product life and prevents leakage, induction cap sealing is widely recognized by the packaging industry as one of the most effective means of sealing containers, offering unrivaled product integrity. We manufacture an extensive range of advanced, solid-state induction cap sealing systems. These are suitable for all types of containers and can be easily incorporated into production lines. Our sealing heads suit all types of screw closure from 12mm to 150mm diameter. We also offer adjustable sealing heads that can be mounted over production lines to seal containers of varying capacity and height. 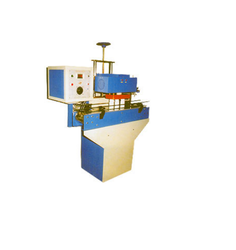 We are able to offer custom built systems where required to ensure smooth and trouble-free operation. In addition to the supply of induction systems, we also provide full installation services. Suitable for non-metal containers of glass or plastics bottles, such as ABS, PE (HDPE, LDPE) PET, PP, PS, PVC. Suitable for food, beverage, pharmaceutical or chemical industries. Fast and efficient. The foil seals tightly without being affected by moisture, grease or powder contamination on sealing area. Easy and simple to use. All functions are clearly labeled on the display panel, which is convenient to access. Modular component design minimizes maintenance requirements. Water flow switch is provided for preventing damage to the head. No foil or stall bottle detector. Low or High power indicator. Solid state elements contribute high efficiency yet low power consumption. Quick adapters on power and control wires provide easy replacement. Height of electromagnetic coil is adjustable for range of bottle heights. 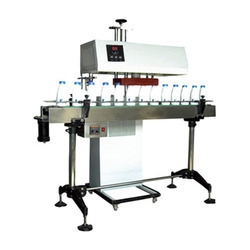 Looking for Induction Cap Sealing Machine ?